The Latvian Lats was the currency of the Baltic state of Latvia from 1992 until 2014, when it was replaced by the Euro. The name ‘Lats’ is derived from the country name ‘Latvia’, which was named after the ancient Latgalians, one of the old Indo-European Baltic tribes. The plural of ‘Lats’ is ‘Lati’ or ‘Latu’, depending on the number. Latvian Latu are now obsolete. 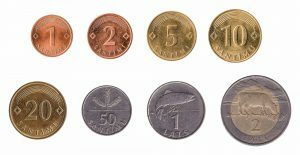 At Leftover Currency we specialise in the exchange of obsolete currencies, like the Latvian Lats. Our online exchange service is quick, easy, secure and free of charge.